My friend recently had some of his works exhibited at the Towada Art Center (http://www.artstowada.com/) for a temporary exhibit about the world of Sumo. Sumo is the national sport of Japan, but it is even more a big deal in Aomori since many talented wrestlers have come from here. The Towada Art Center is located in Towada City, and it really is an “art center” instead of a museum. I think the creators of the center were aiming for something that doesn’t sit static in the town, but actually interacts and energizes the entire community. I found this out firsthand during my visit when I got to not only see the art, but meet and talk with the friendly local people. 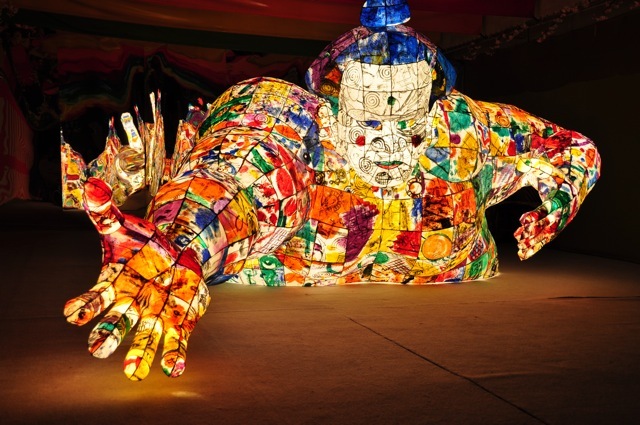 In fact, Towada City is aiming to become a city that vigorously promotes the arts. The art center is still in its infancy, having opened in the spring of 2008. A gigantic red ant, a house that looks like it was made out of marshmallows, and a gigantic flower horse are just a sample of some of the permanent installations on the grounds. 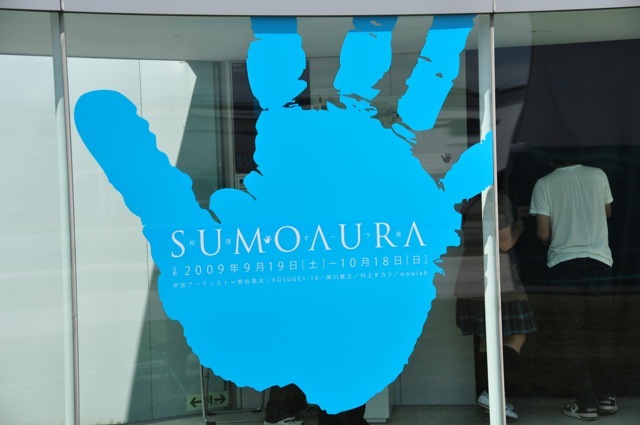 I could fill an entire blog just about the permanent collection, but today I want to talk about SUMOAURA, the exhibit I went to see. In the Sumo world, handprints are the way wrestlers give autographs. Unfortunately photography wasn’t permitted inside the galleries, but that doesn’t mean there isn’t plenty to show or tell about. 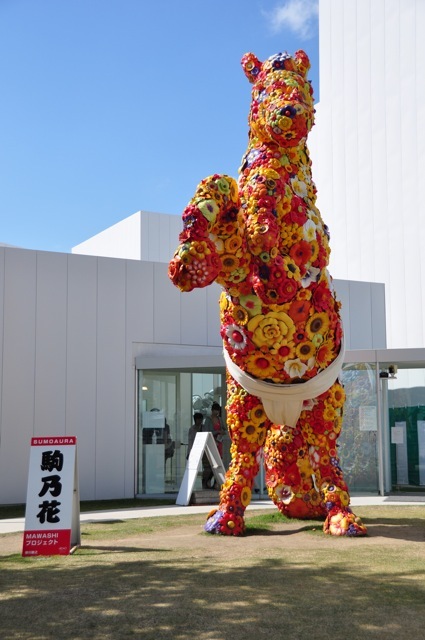 This is the gigantic flower horse located at the entrance of the center. It has come to be a symbol of the center and a beloved resident of the city. Towada City in fact is famous for its history of being a prime horse raising area for samurai since feudal times. Anyway, what’s unique is that during the SUMOAURA exhibit, the whole town was involved in the “MAWASHI” Project. If you have ever seen Sumo, then you’ve no doubt seen “mawashi” as these are the only garments the Sumo wrestlers wear when it’s time to compete. 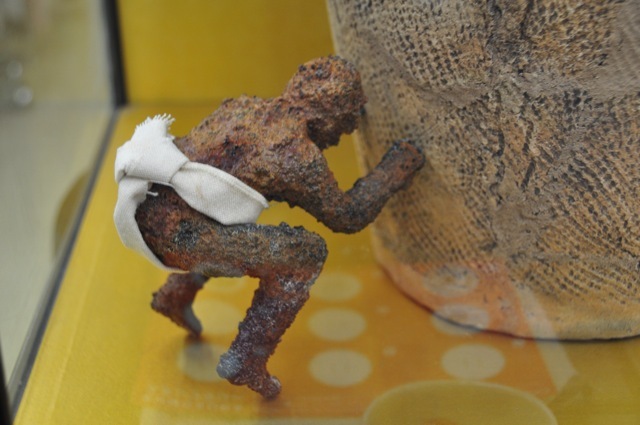 As part of the project, various objects all around town were decorated with these symbols of manhood and Sumo spirit. Each of these objects is also given a suiting Sumo name, here “Flower Horse” is rendered into old fashioned Japanese. 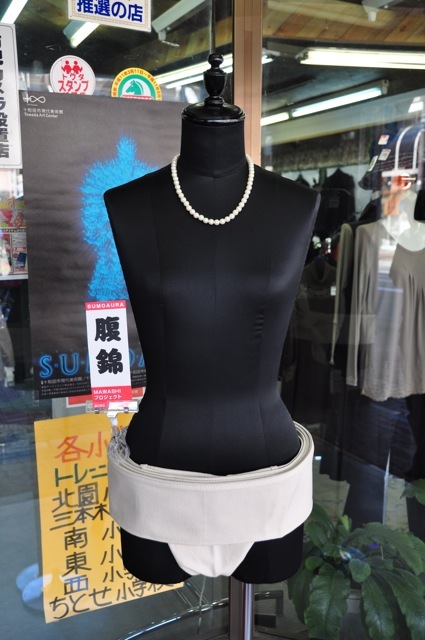 Even the mannequin at the local boutique got in on the "MAWASHI" Project. This lovely lady's Sumo name is "Hara-Nishiki" which means something like "Brocade Gut" perhaps due to her satin stomach. This is a Sumo wrestler nebuta, or traditional festival craft from Aomori carefully made out of Japanese paper on a bamboo frame. Close-up of the Sumo Nebuta. I found this beauty while walking the main street downtown. 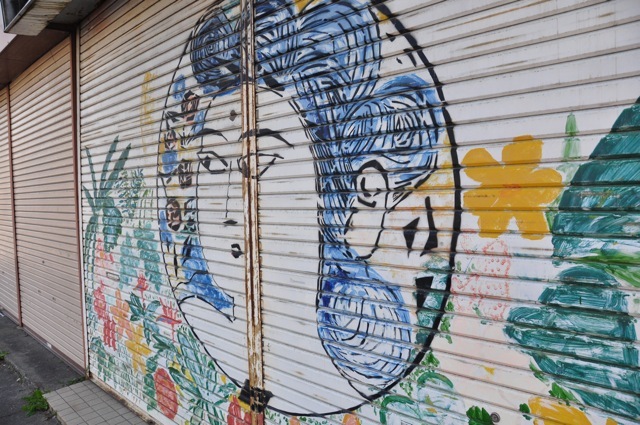 The shop was closed as it was a Sunday afternoon, but the design is an imitation of some of Shiko Munakata’s works. 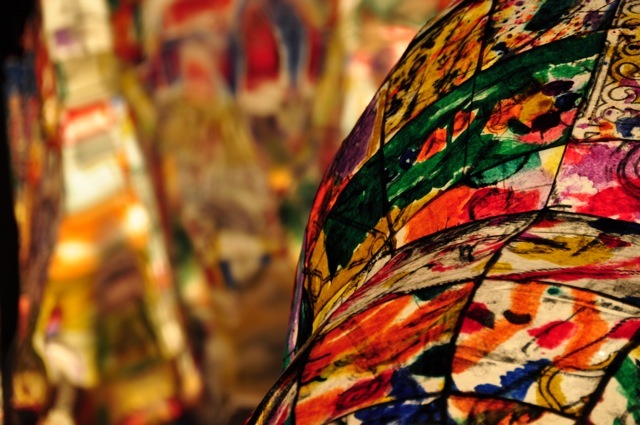 Towada was becoming more and more of a creative artistic city by the moment. Even in the park (where they also have the town Sumo ring naturally!) there were things going on! I was lucky to catch the Cardboard Sumo Tournament. 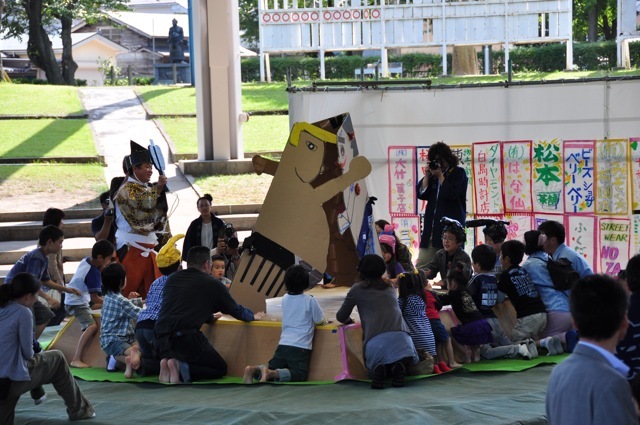 Children created and designed their own unique Sumo wrestlers out of cardboard and made them wrestle by fiercely slapping the base of the Sumo ring. The whole town was going Sumo! 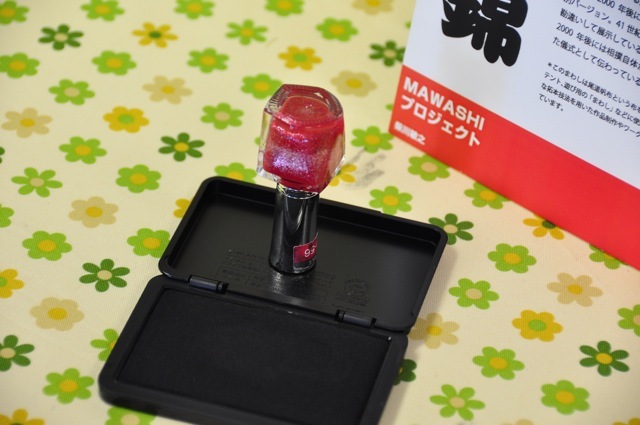 I continued to gather stamps while peering in every shop window looking for more “mawashi” creations. One shop was a general store and the stamp was the bottom of the elderly owner’s cane who smiled as he stamped my paper. This stamp was the top of a nail polish container in the local beauty parlor. The woman running the shop was so nice that it made me want to get my nails done, but I didn’t because I am a guy. Yep, there were even motorcycles Sumo'ed up in "mawashi"
I finally managed to collect all but one stamp. Only one shop was closed as it was late Sunday afternoon when I went. One shopkeeper even opened up her whole shop to show me around even though she was closed. We had a great conversation about how the power of the arts is bringing their community even closer together and bringing Towada City closer with the outside world. I agreed. 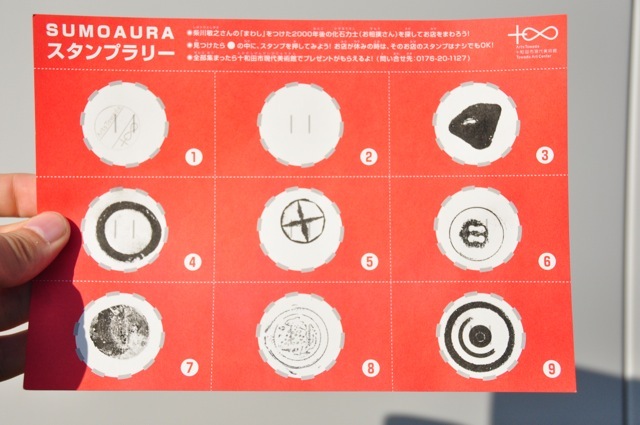 My stamp scavenger hunt complete, I went back to the art center to claim my prize, a cool SUMOAURA pin. The pin was a great way to end a fun day filled with experiencing the arts. I guess however, that my biggest prize had to be the all the great smiles I got in Towada. 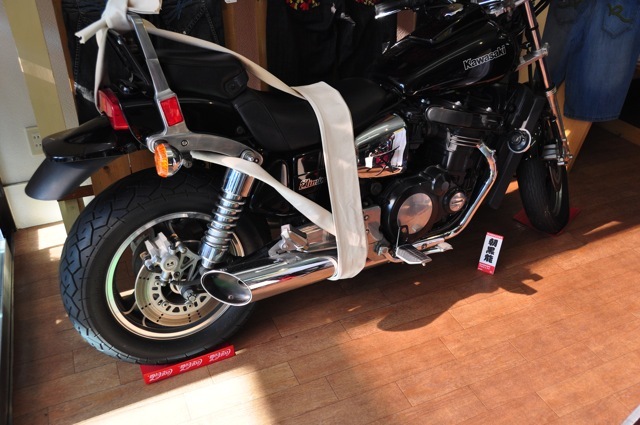 This entry was posted on November 30, 2009 at 1:12 am and is filed under Towada-city with tags aomori, art, museum, sumo towada. You can follow any responses to this entry through the RSS 2.0 feed. Both comments and pings are currently closed. This piece encourages me to visit Aomori much sooner than later. The pictures captures the true essence of the show. I’d love to see that Sumo Nebuta! It looks beautiful!